Richard Whitten earned a B.A. in Economics from Yale University and an M.F.A. 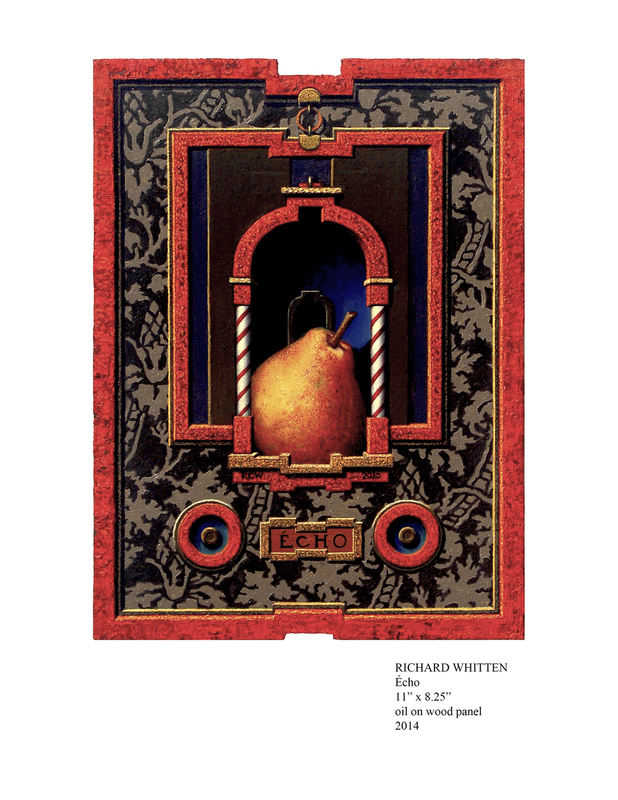 in Painting from the University of California at Davis where he studied with both Wayne Thiebaud and Robert Arneson. He has had numerous exhibitions on both coasts. Notable are major solo exhibitions at the Frye Art Museum in Seattle, Washington, the Newport Art Museum in Newport, Rhode Island, and the University of Maine Museum of Art. He is presently a Professor of Painting and Department Chairperson at Rhode Island College. Visit his website here by clicking here. My paintings imply the existence of places and of “objects of desire” that, like the garden and flowers in Alice in Wonderland, can be glimpsed but neither reached nor acquired. A recurring theme in my dreams is the discovery of beautiful hidden architectural spaces. I find unknown buildings or passages. I make efforts to get to them and to explore them. Sometimes, I can indeed explore them in the same dream. Sometimes, I have to find them again in another dream – often years later. It is from these dream images that I construct my paintings. I am drawn to antique toys, mechanical devices and scientific instruments – particularly those that involve repetitive motion. 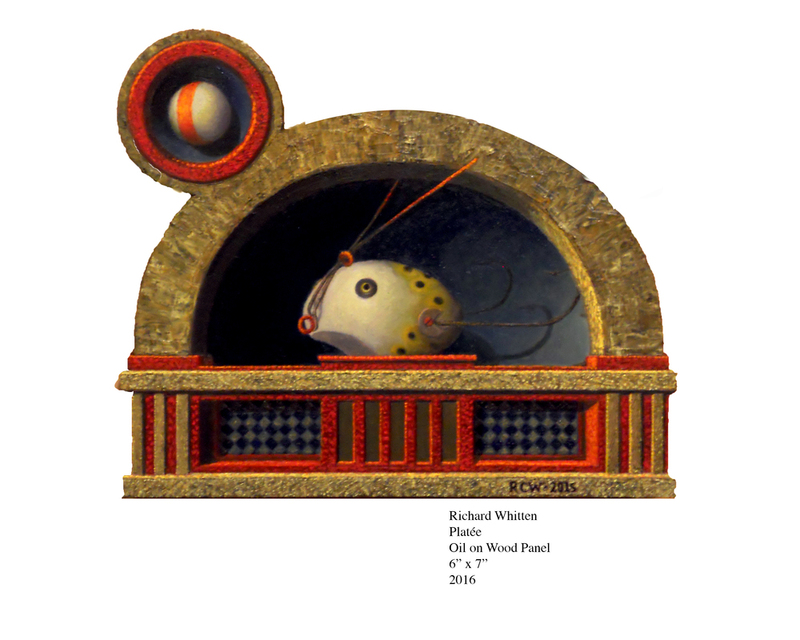 I have built several “working models ” of such invented machines, which I use as references for my paintings. I place these “machines” into the world of the paintings, waiting for the moment when the viewer’s glance animates them. In that moment, the viewer and I begin a conversation. I wish the viewer to have an almost physical sense of the transition between his or her own world and that of my paintings. As the journey begins, the viewer sees that the paintings are on non-rectangular wooden panels. In the painting “Homage to Dellschau: Bumblebee”, one first sees three shaped panels reminiscent of a body and two wings. This painting is pointedly an object, referencing a bumblebee or a flying machine. That object exists in the world of the viewer, having a physical and sculptural reality. Parts of the painting are like the marginalia of an illuminated manuscript. They act as both frame and guide into the painting. The viewer travels through an imaginary entrance to the painting’s private world. There, the viewer can visually “touch” a gyroscope-like machine and mentally set it in motion. These paintings are on birch plywood panels that are cut to shape. The image is entirely flat. The “frame” is an illusion. The panel is, however, made to look thick by building up the edges behind the plywood. They are braced on the back with a grid of maple strips that both stop the wood from warping and make the panel “hover” off the wall when mounted.